A few months ago, Scott Hanselman announced, new solution which change mobile development for Microsoft world, and the others somehow too. That solution was called Microsft PowerApps. The solution wasn’t available for tests, it was just possible to register for preview waiting lists. Fortunately I work for the company which placed almost entire business in the cloud and Microsoft help us a lot with this. And thanks to my boss I was able to get early access to this coll tool. As far as I know right now PowerApps are available in preview for everyone, but I can see it in my App launcher. Well let see how it works. As you can see it looks simple. 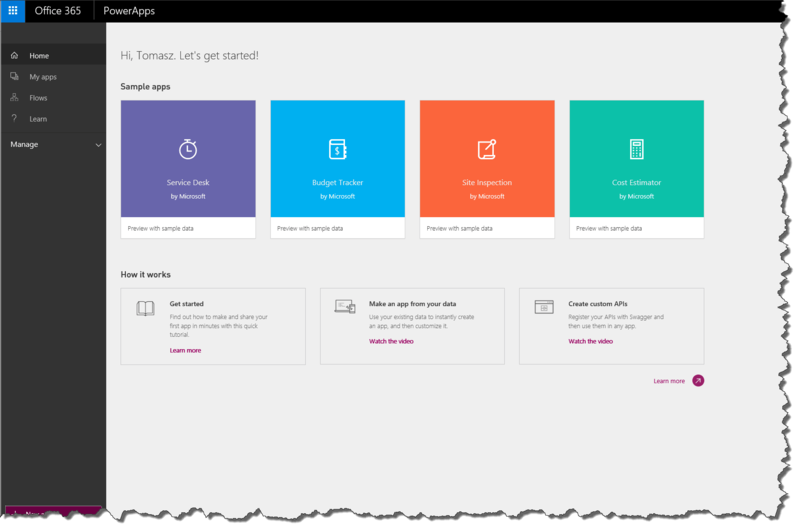 We also get four applications which Microsoft prepared for us to discover how PowerApps works. Let’s try to building something by our own. I have very simple list in our Office 365 SharePoint online. This list is used for presenting some basic sales data. I just have there: Cashier name, net sales, clerk id and report day. 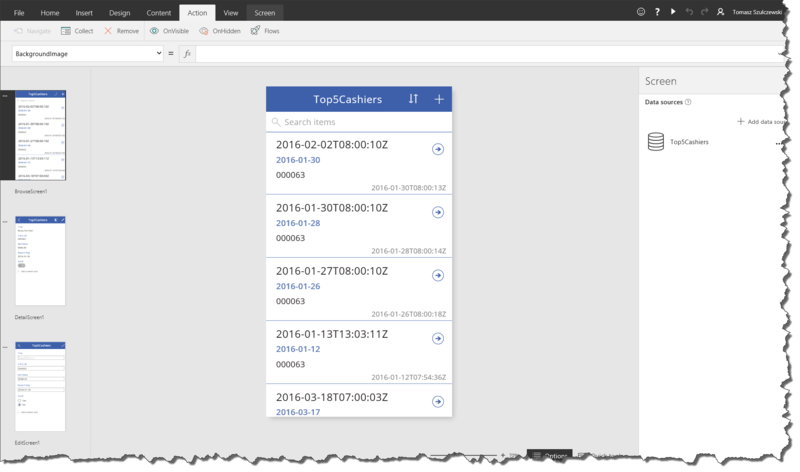 Those information are updated on daily basis by simple CSOM console application, which sends data from our ERP to SharePoint online. Press “New app” button. You will see pop up message “To create and edit apps, you need to install PowerApps Studio for Windows.” I have already installed it, so I have to just press “Open it”, and press “New” to start. You will see possible sources for our application. As you can see PowerApps were presented as simple solution for non developer people, but it’s looks very powerful. I think that in some cases mobile application can start worry about it… Let’s come back to our app. Now it’s time deploy our PowerApps to our organization. It’s very simple operation. You just need to “Save as” and then select option “the cloud”, and in next step you have just mark checkbox “Allow access to other users in my organization”. 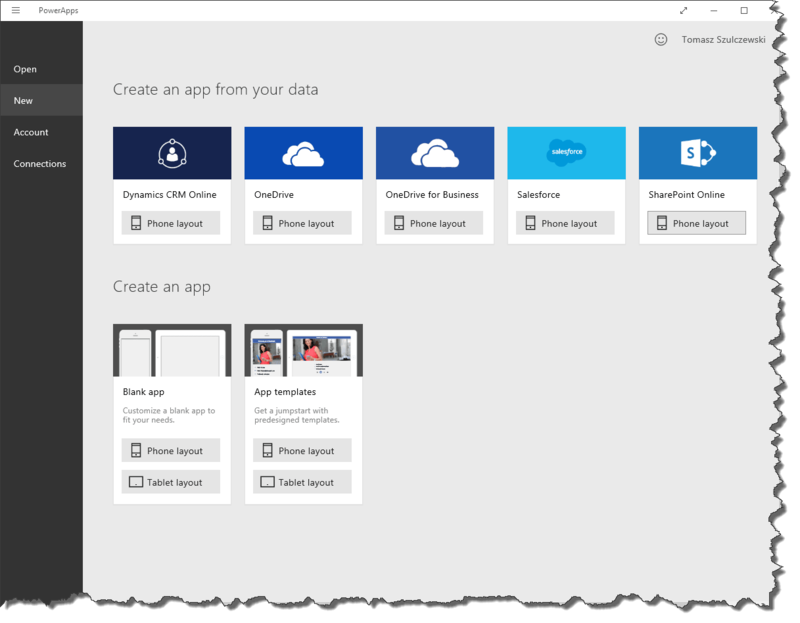 This option will save the app to your Office 365 tenant. 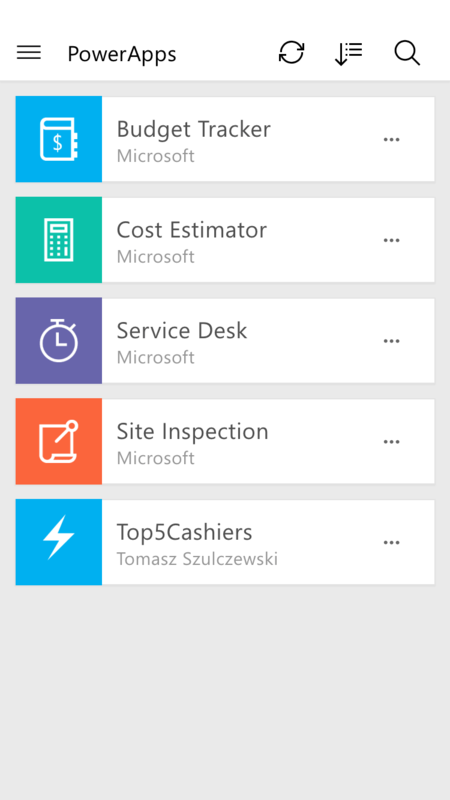 After that when you open again PowerApps and login with your organization account you will see your app on the all available list apps. Also this one is available to you to edit. Now you have just press the app icon and report is ready to go. As you can see entire solution is very simple, but it’s really powerful and it give to us a lot of options. I just find out that it has taken more time to me to write this post than create and deploy app itself.